Things weren’t looking so great for the watch industry at the beginning of the 1930s. The export business declined dramatically between 1929-1932 thanks to the devastating effects of the Great Depression. For watch brands that meant adapt or die. To avoid the latter, by the late 1930s IWC was desperately trying to find other European markets to distribute its watches. Enter the now-legendary Rodrigues and Antonio Teixera from Portugal with a very specific request – apparently Portuguese men were expressing a rather fashion-forward desire for a large wristwatch with all the timekeeping precision of a pocket-watch. To answer their – and in turn many other’s – calls, IWC’s watchmakers came up with the Mod.228 (which was later renamed the Portuguese, before being renamed again to Portugieser). Now one of IWC’s most lauded collections alongside its pilot watches, the Portugieser family offers up some of the most incredibly elegant, sophisticated takes on the sports watch money can buy. Looking for a new heirloom piece? Step this way, sir. Almost over as quickly as it started, Portugieser (the name change from Portuguese to Portugieser occurred in 2015, but all the watches have now retrospectively adopted the German moniker) production was disrupted by World War II and distribution to Portugal was halted. One of IWC’s main markets became Eastern Europe, and it wasn’t until the 1950s that its new line of watches fully found its intended audience in Portugal. However, when it finally got there it wasn’t a huge success, and by the 1970s it was already being phased out. 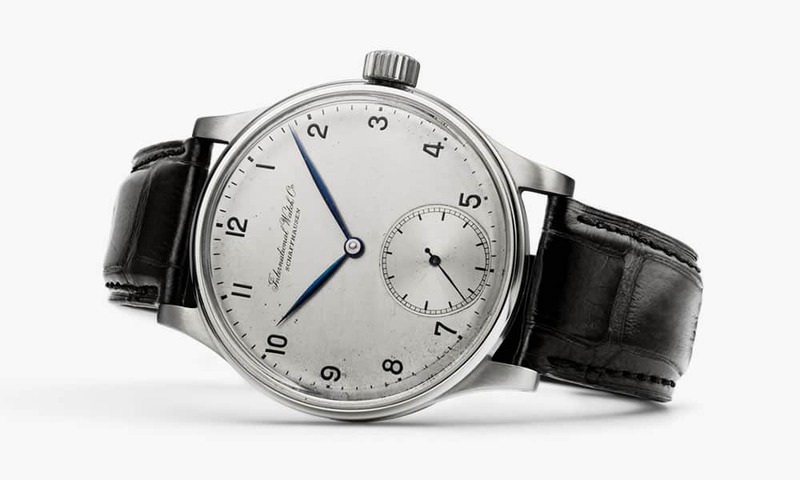 The Ref.325, as it was still being called had a couple of reboot near-misses in the 1970s, but the quartz crisis of the 1980s almost led IWC to quit the wristwatch business altogether to become a niche pocket watch maker instead. “You have to remember,” explains Koullapis, “that in the 1960s and 1970s it was all about refinement, which meant small watches. Then, by the time you get to the 1980s, movement production is down massively so brands were relying on generic movements and making watches that were commensurate to their size.” So essentially, it was wrong time, wrong place for the Portugieser. Then in 1993, for the 125th anniversary of the luxury watch brand, it was brought back to life. Aside from the numerical font, this was the same watch that the Teixera brothers first requested back in the 1930s; it even contained a movement – calibre 9828 – that was based on the pocket-watch original. To say it’d be more popular this time around would be an understatement. After the anniversary edition in 1993, two years later saw the Portugieser gain a minute repeater and team up with a rattrapante chronograph. 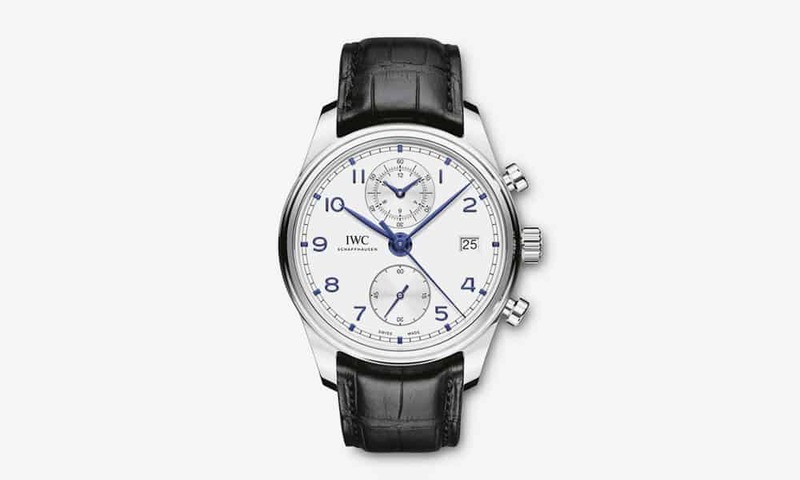 Then in 1998 IWC launched the Portugieser Chronograph Ref. 3714. Considered by many to be the definitive and most coveted of the range, it is one of the most successful post-Quartz Crisis designs. However, it didn’t become a coherent collection until 2000 with the release of the Portugieser 2000. This watch, or more specifically the Calibre 5000 under the bonnet, marked the reboot of IWC’s in-house watch movement development. It also brought back IWC’s legendary Pellaton winding system. Patented in 1946 and completed by 1950, it was invented by the then-technical director Albert Pellaton and uses pawls (a lever with a beak, which, when activated by a spring, engages with the teeth of a wheel) – rather than direct gearing between the rotor and barrel. For the millennium revamp, a second pawl was added to help ‘pull’ the massive mainspring barrel needed for the 8-day power reserve. In 2015, the entire collection was reworked and nearly a dozen new models were added, as were three new movements. Several of the designs also featured a new domed sapphire crystal, while in 2018 to celebrate the brand’s 150th anniversary a constant-force tourbillon was launched and the Perpetual Calendar Tourbillon, Perpetual Calendar, Chronograph and Hand-Wound 8-Days were given the birthday treatments with new movements and complication configurations. Originally the defining features of the Portugieser were a pared-back dial, Arabic numerals in an Art Deco-esque font, an oversized sub-dial at six o’clock and a thin bezel. However, the Ref. 325 had multiple iterations. Dials could be black or silver, numerals Roman or Arabic and the design moved from Art Deco to a more Bauhaus look. Now its defining characteristics are Deco-style Arabic numerals, slim feuille hands and a railway track-style chapter ring. Dials always feel capacious even when housing multiple complications and the case is never anything other than oversized. IWC has made no bones about positioning itself as the only brand a man needs. For dressy occasions you have the Portofino; the Ingenieur is your tool watch, the Aquatimer is there for all your diving watch needs and the Portugieser is the everyday classic, which does mean there really is no wrong way to wear it. It should be a timepiece that effortlessly elevates your outfits from the pedestrian. Yet its understated design ensures it’ll never dominate a look or draw unwanted attention from passersby. That said we probably wouldn’t pair it with swim shorts – save your Aquatimer for that. IWC’s instantly recognisable model has spawned numerous iterations over the years, ranging from simple time-only pieces through to highly complex tourbillons and even an incredibly rare piece that displays the night sky on its caseback. Here are the best. This is the original Portugieser. Its dial has echoes of the 1930s original; it has the railway-track chapter ring, the appliquéd Arabic numerals, feuille hands – if we were playing IWC Portugieser bingo we’d be yelling ‘house’ right now. It’s even got the Pellaton winding system, translating to a 7-day power reserve, which can be see through the sapphire caseback. If you want the ultimate example not only of this collection but of everything right about IWC then look no further than this 42.3mm puck of loveliness. The watch generally considered to be the best design to come out of a post-quartz crisis Switzerland, this is also the most refined Portugieser in the collection. It’s a modest 40.9mm in diameter, making it ideal for more slender wrists; has a beautifully laid-out dial and is definitely at the more dress end of the sports-watch spectrum. There are other options but you’d be a fool not to opt for the blue dial; it’s the last word in everyday elegance. This is a sports watch at its most chic. Having the chronograph counter at 12 is an interesting touch, while the in-house calibre 89361 that powers it allows stopped times of up to 12 hours to be read. The classic combination of blued numerals and hands against the smooth silver-plated dial is perennially stylish, making this the perfect everyday watch. The sportiest of the Portugiesers, this is a watch that manages to be both practical and good-looking. Alongside a flyback chronograph, it also has a quarter-second scale so you can measure short stop times as well as an analogue sub-dial display for longer stop times. It is the only iteration to have luminescent hands and indices and, just to emphasise its sporty credentials, it comes on a rubber strap rather than the more traditional leather. For some, the decision to show the month, date and day in three separate windows would result in a watch that feels top heavy and a little clunky design wise. However, IWC has managed to pull it off and it’s not just a beauty, it has brains too. Its advance mechanism automatically takes the length of individual months into account and therefore only requires manual correction via the crown once a year at the end of February. The curved lugs mean it sits close to the wrist and the sapphire case back allows you to admire the in-house 52850 calibre in all its glory. The first thing you notice about this perpetual calendar is the almost Bauhaus-inspired moon phase. It is a double moon display that diverges by just one day in 577.5 years and shows the celestial body’s state in both the northern and southern hemispheres. We’d be quite happy with that complication on its own but IWC has added a perpetual calendar as well and still managed to make the dial feel comparatively uncluttered. Thanks to the movement, which is from the 52000 family, it runs for seven days and comes with the lauded Pellaton winding system. Other colours are available but the slate-grey dial combined with red-gold case looks delivers the highest levels of retro sophistication. A little busier dial-wise than the usual Portugieser, this complication-packed version still doesn’t feel cluttered thanks to the extra three millimetres added to the case diameter meaning that, at 45mm, it might not be for everyone’s wrist. Packed into this more substantial frame is a perpetual calendar that doesn’t require correction until 2100, a flyback chronograph, and a large digital date and leap year display. As this is all powered by the in-house 89801 movement you also get the legendary double-pawl system as well. If you’re going to have something disturb the placid symmetry of a Portugieser dial then it might as well be a tourbillon. Unusually set at 9 o’clock, it is a reminder that IWC has some serious watchmaking nous in its ranks. It comes with a white dial and red gold case but the sartorial choice is this grey and white gold version. An added bonus is the Santoni leather strap that comes as standard. Given its slightly fancy nature, a minute repeater isn’t usually found in such a contemporary case design; even the repeating slide, seen on the case between 10 and 8, is an exercise in elegant simplicity. It’s powered by the 98950 calibre, which is a hunter pocket-watch movement IWC first debuted in the 1930s. Despite its reputation for simplicity, the Portugieser is also the place where IWC get to show off their watchmaking chops, which explains this amazing piece. At its heart, or rather at 12 o’clock, is a flying tourbillon, comprising a staggering 82 parts, that appears to float untethered in its space. The retrograde date is a whimsical touch, while the seven-day power reserve means there shouldn’t be any faffing getting it date accurate when you put it on again. As the name suggests this watch is packed with horological clout. There’s the perpetual calendar that is accurate until 2499 (with only three adjustments needed in 2100, 2200 and 2300), a minute repeater, a moon phase and a chronograph with 659 mechanical parts making a total of 20 functions possible. All this happens thanks to the calibre 79091. Launched in 1991, it has a base Valjoux 7750, which is given some extra oomph by an in-house calendar and minute-repeater modules. To be honest, you probably aren’t going to be in the market for this member of the Portugieser family but that doesn’t mean you can’t marvel at it, because it really is IWC putting all its toys into one watch. Along with a constant-force tourbillon and 96-hour power reserve, it also shows sidereal time – time reckoned from the motion of the earth in relation to other distant stars rather than the Sun. However, it’s the reverse that’s really special. Using a location specified by the owner, IWC makes a rotating night-sky disc showing more than 500 stars and constellations correlating to what would be seen in real life. Making the necessary allowances for summer time and winter time, the watch also displays the times of sunrise and sunset, sidereal time and a perpetual calendar with the leap years. It is less a watch and more a work of art.